Amazon.com description: Product Description: This book constitutes the refereed revised post-workshop proceedings of the 5th International Workshop on Network and Operating Systems Support for Digital Audio and Video, NOSSDAV '95, held in Durham, New Hampshire, USA in April 1995. The 24 full papers included were selected from a total of 101 submissions; together with overviews by the session chairpersons they reflect the state of the art in networking and operating systems support for multimedia. The papers are organized in sections on advance reservation systems, operating systems support, resource management and quality of service, audio and video systems, and scheduling and synchronization. 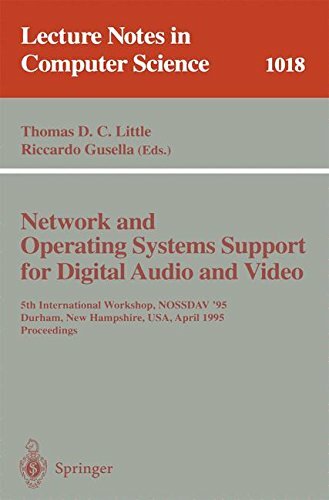 About: This book constitutes the refereed revised post-workshop proceedings of the 5th International Workshop on Network and Operating Systems Support for Digital Audio and Video, NOSSDAV '95, held in Durham, New Hampshire, USA in April 1995.